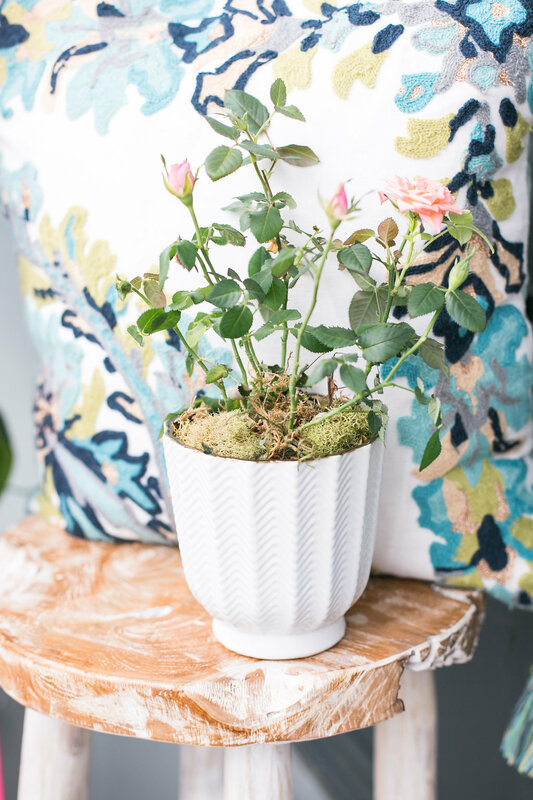 When you live in a small condo, making the most out of your space is essential. The most frequent user of our balcony is Margot who apparently enjoys sniffing around the empty, sad looking space. 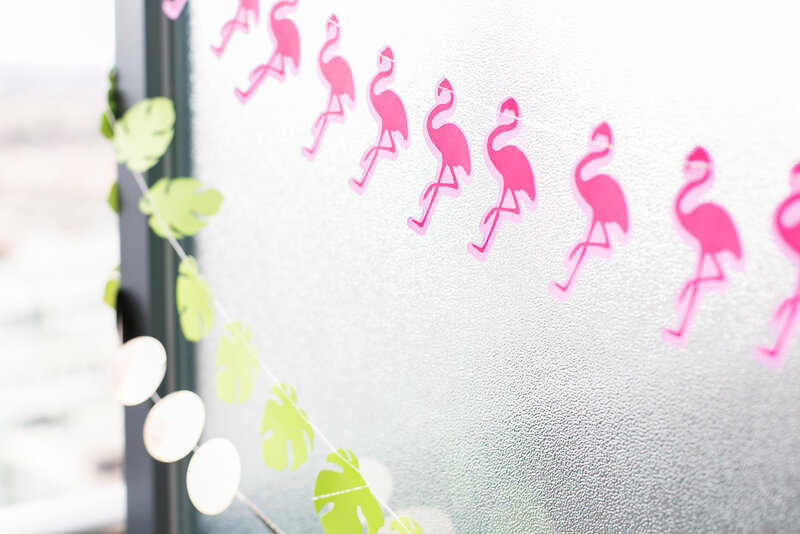 Tackling our balcony decor has been on my to do list for a while now. Finally, I decided to challenge myself and make the most of our tiny space. 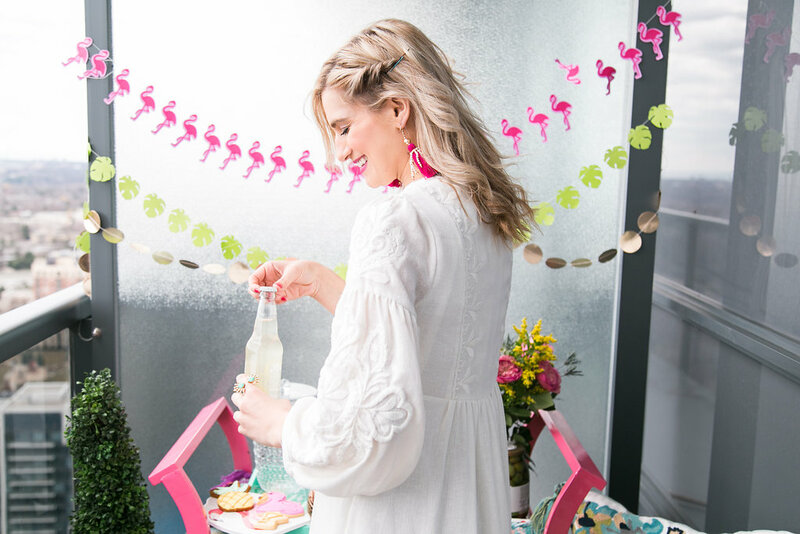 If you follow me on Instagram,you know that HomeSense is my soul sister. 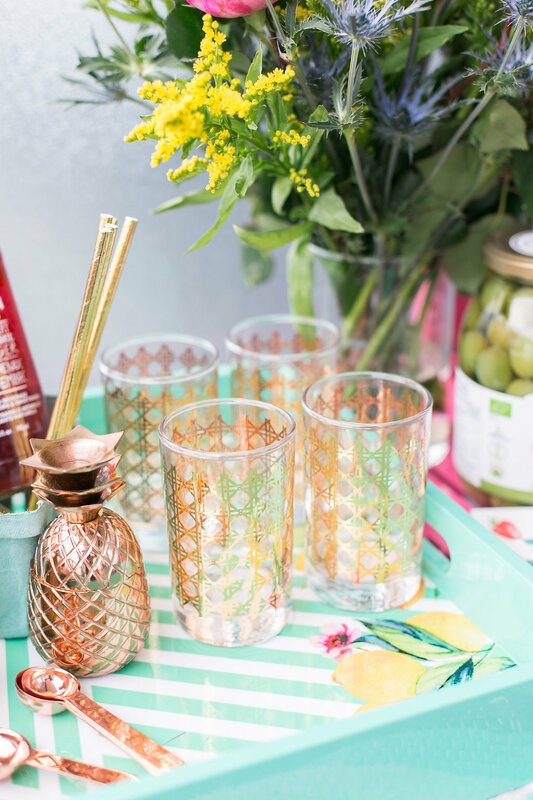 When I was looking at options for our balcony I knew HomeSense was the store I could count on to find all of our patio needs. 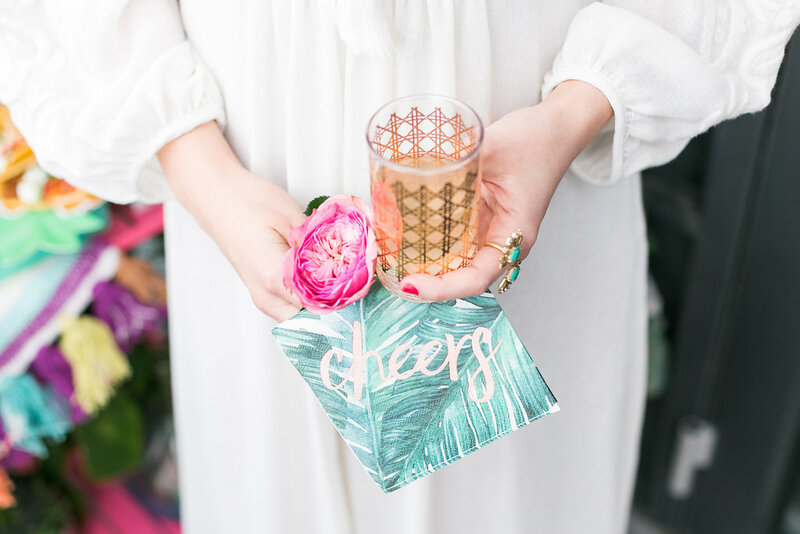 My vision for our small patio makeover was a tropical getaway in the city. 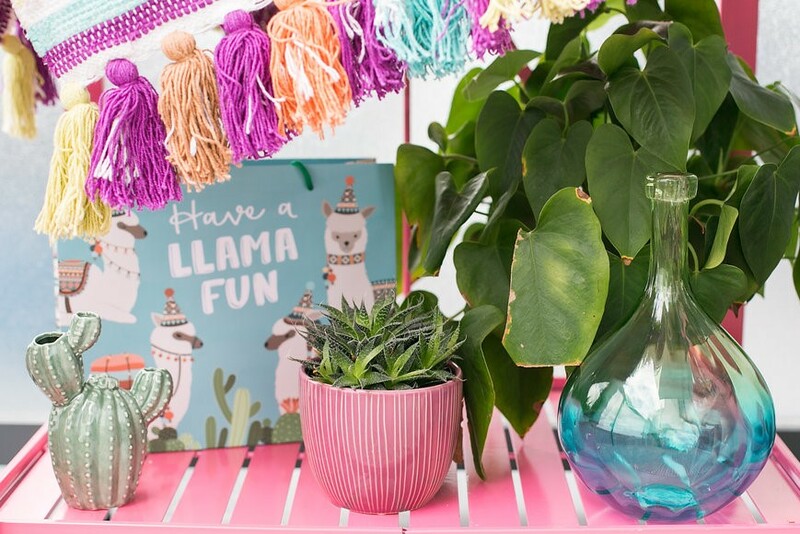 Lots of colour and plants. 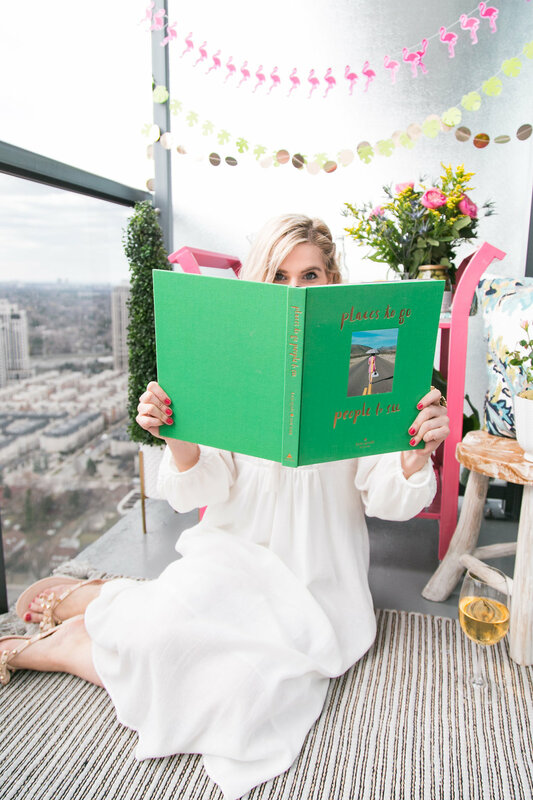 I wanted us to feel like we are stepping into Palm Springs even though we are really stepping into our tiny, concrete, balcony. Living in the heart of the city you need as much greenery as possible to turn your balcony from concrete jungle to a garden oasis. I was able to add a few plants here and there, and I would love to add more, but I am no gardener. That’s why I opted for some artificial plants as well from HomeSense to solve that issue. Hassle free, no water needed and you can have them for years and years to come. 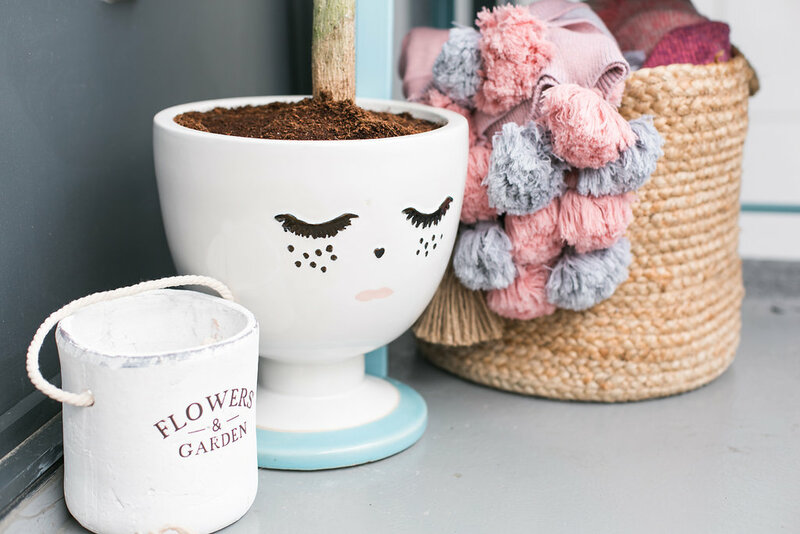 I also added a cute face flower pot to break away from the traditional flowerpots that tend to be a bit boring in design. 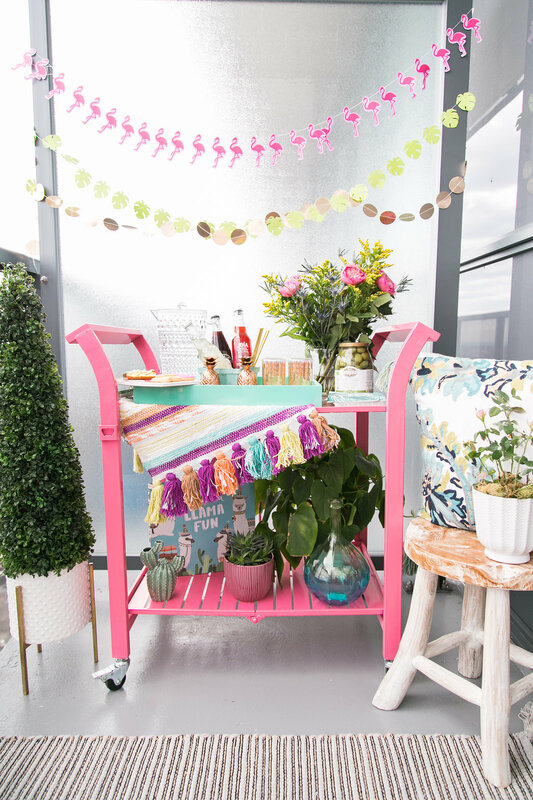 When entertaining in a small space like ours, a large table can take up half of your balcony space. Choosing small, compact furniture is key. Instead of a rectangular table which will take up a lot of room, a great option for saving space are small round tables. A small round table pushed on the side instead of being placed in the center of your balcony, will not make room for other sitting furniture, but will also give the illusion that your balcony is quite spacious. 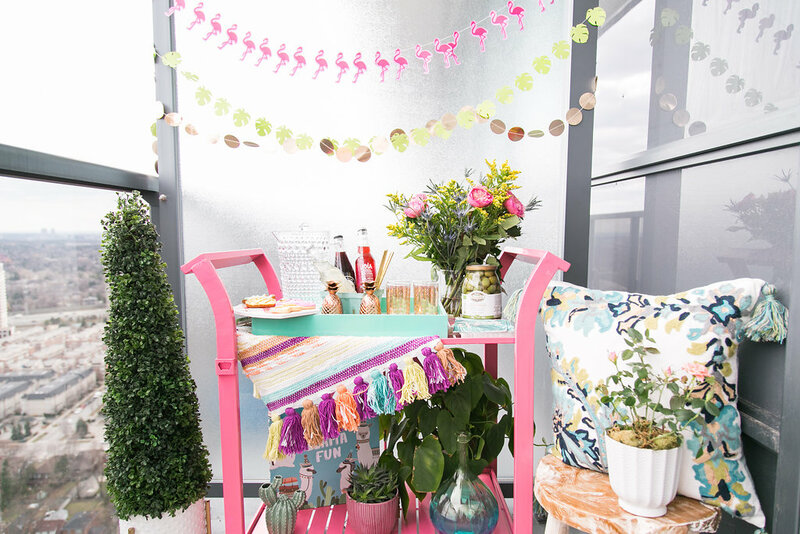 To add a bit of a fun, tropical element to your balcony, go for unconventional shaped tables. 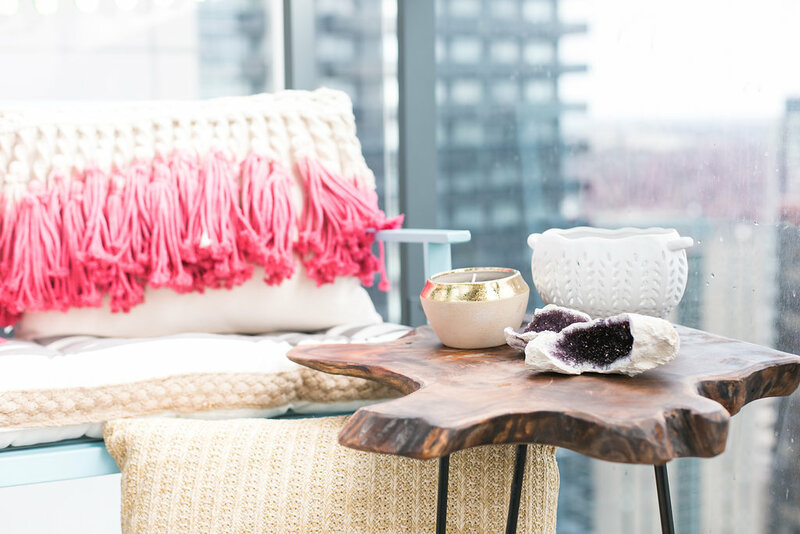 I chose a beautifully crafted tree trunk table that saved tons of space. 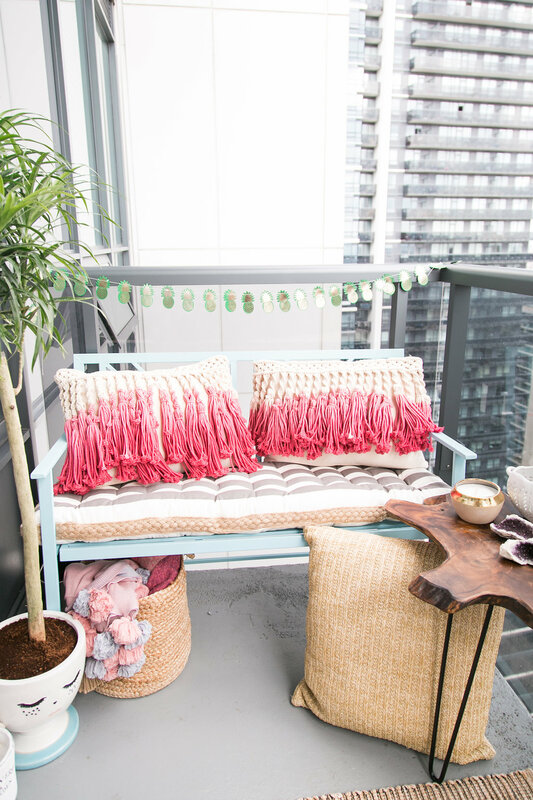 To make the most out of your small balcony, look for a bench as your main outdoor sitting furniture. 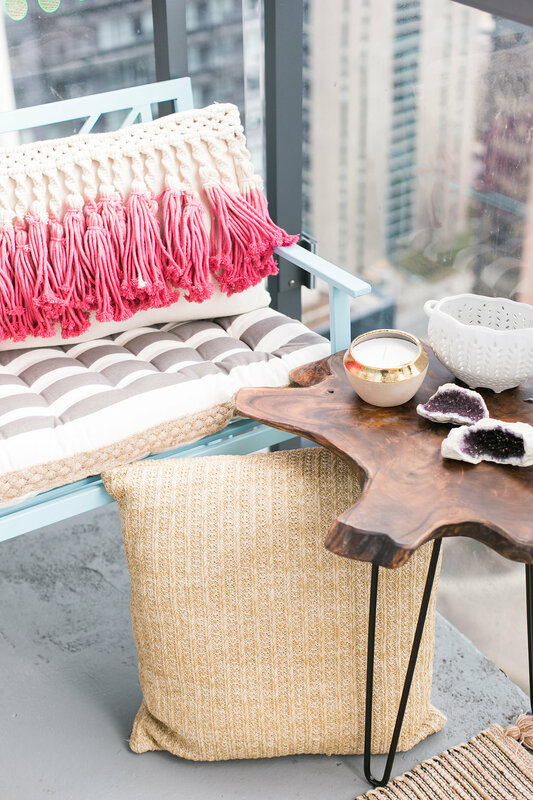 A bench is a great option for small balconies. 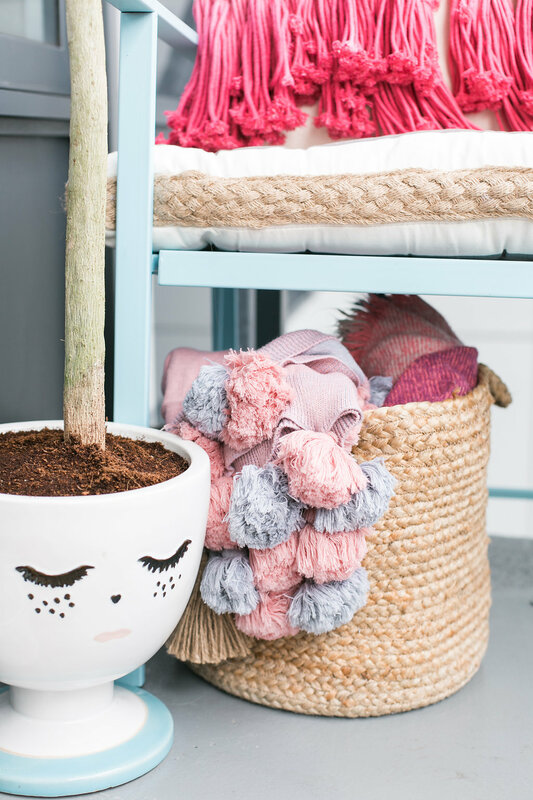 We pushed ours right against the railing which maximized our space.What I love about benches is the fact that they give room for storage. 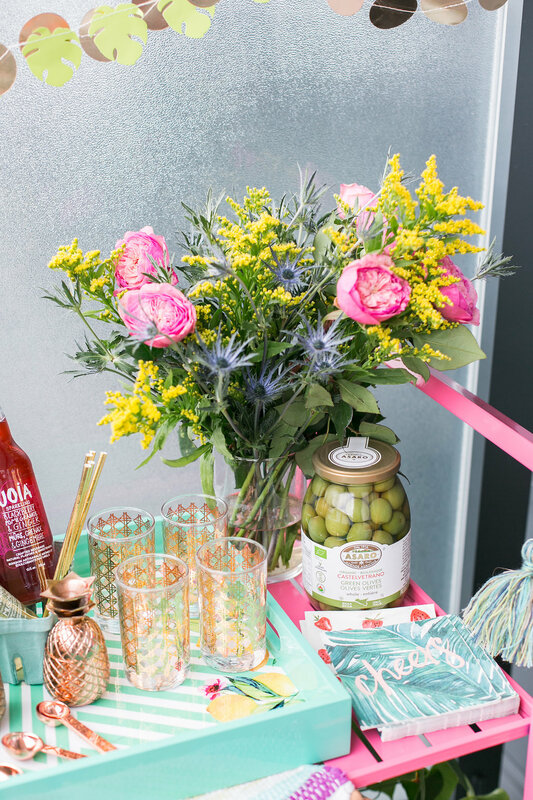 If a bench is designed like a box then you can store all of our balcony entertaining essentials in there or if it is like ours then you have tons of additional storage underneath. I stored a wicker basket with a couple of blankets under our bench in case it ever gets breezy while sitting outside at night. 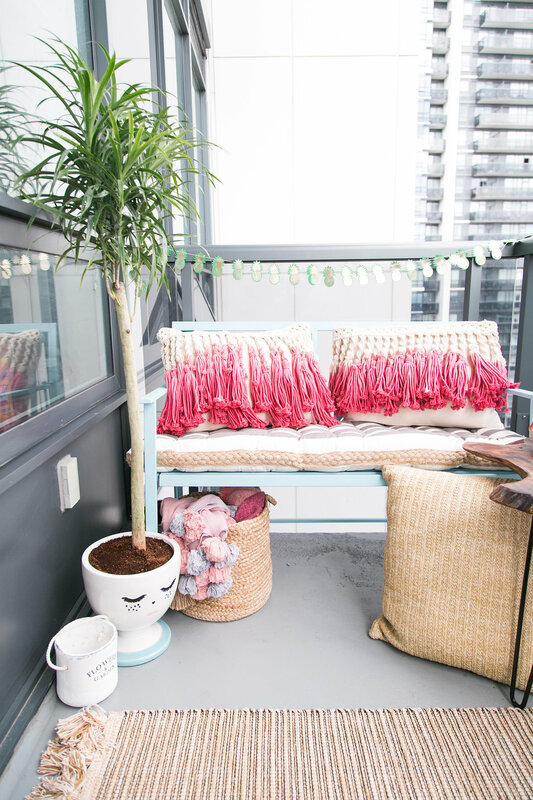 I also love putting all of our floor pillows under the bench as well to keep the balcony clutter free. 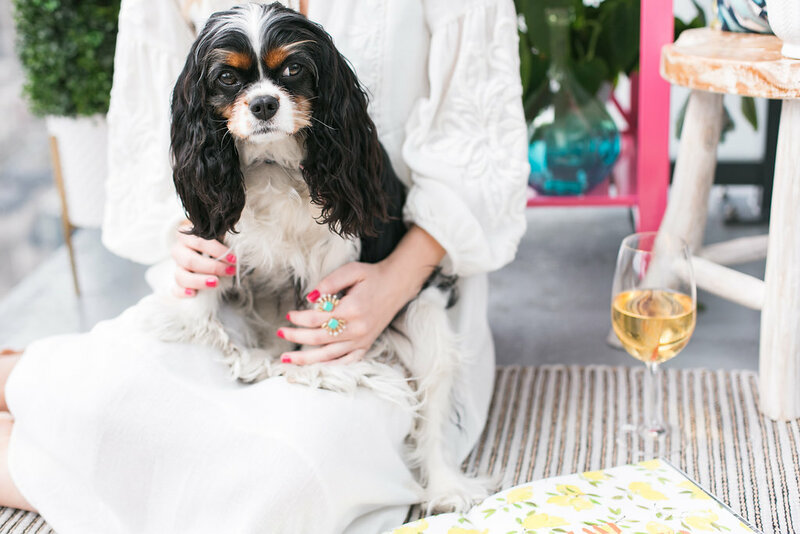 If you are looking to entertain an older crowd, and you are very keen on having the traditional table and chair set for your small balcony, a Bistro set is the perfect option. 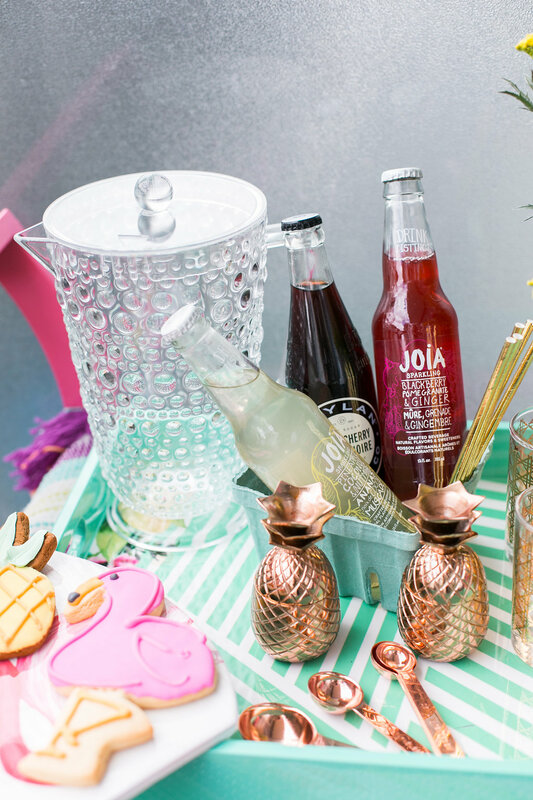 Due to their compact design, bistro sets will not only save space, they will also maximize your space for other fun decor items like a bar cart or even more plants. 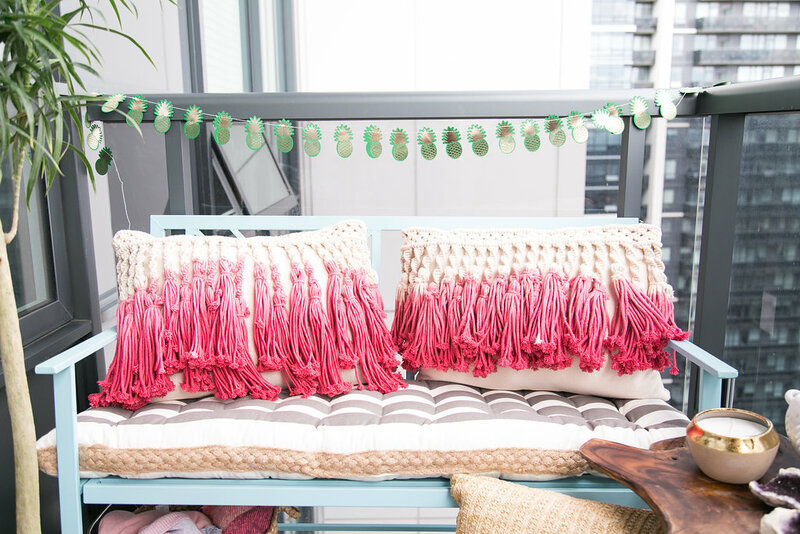 If you want to take your small balcony decor to the next level, adding an outdoor carpet or rug is a must. Even though our condo is just a couple of years old, the balcony floor is just so mundane. To cover up all the ugliness, I added two small rugs. 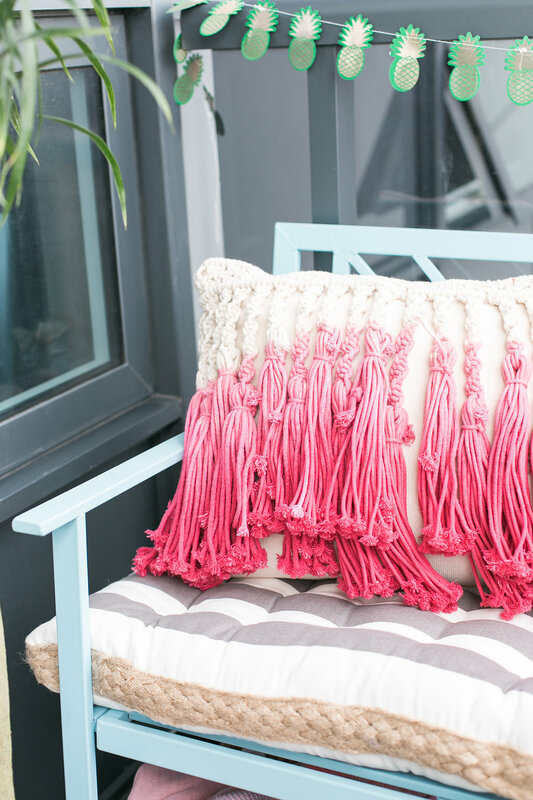 I am also loving the tassels that are at the edge of each rug. Adding large floor pillows as additional seating is a great way to preserve room.Using pillows for seating not only makes the space more intimate, but also makes your guests feel right at home. Also, large floor pillows are great if you are having over your little nieces or nephews. My niece loves sitting on them. Poofs are also another great option to consider. I added large pillows all around the balcony. They don’t necessarily have to be placed on the floor. 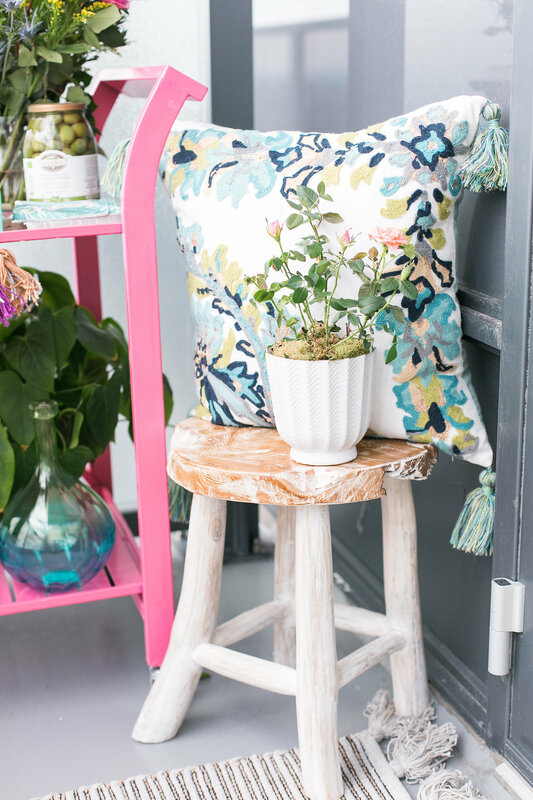 I keep the large pink fringe pillows on the bench, and the floral green pillow on the stool until someone needs to sit on them. 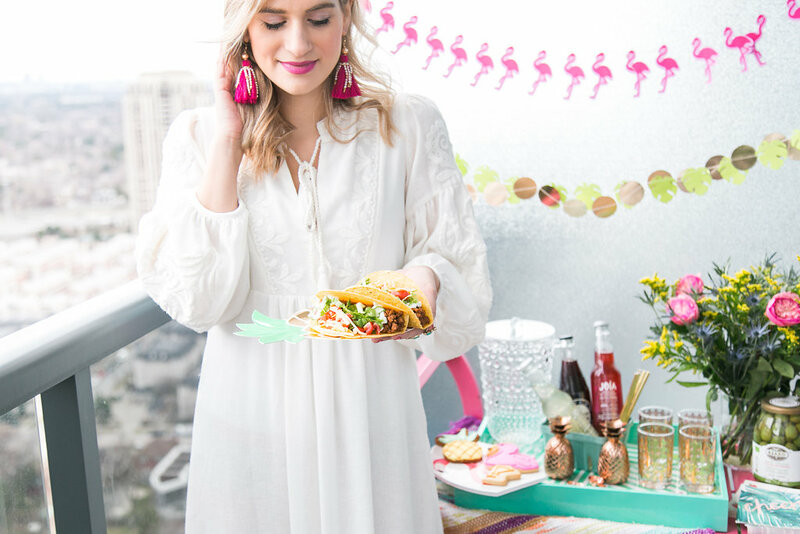 There is more to Mexican cuisine than tacos, but tacos have got to be my favourite entertaining food especially for Taco Tuesday or Cinco de Mayo. 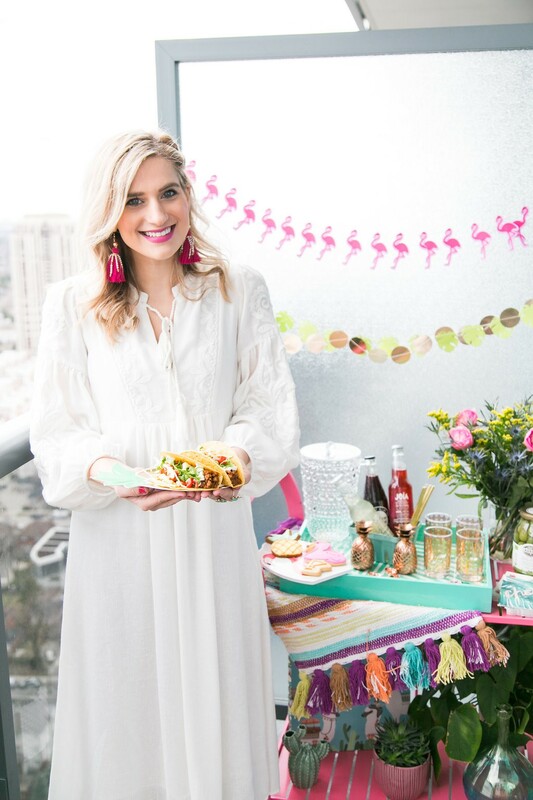 It is not a mess free dish, but what I love to do is prepare all the tacos in my kitchen and then serve them on my balcony on disposable plates. 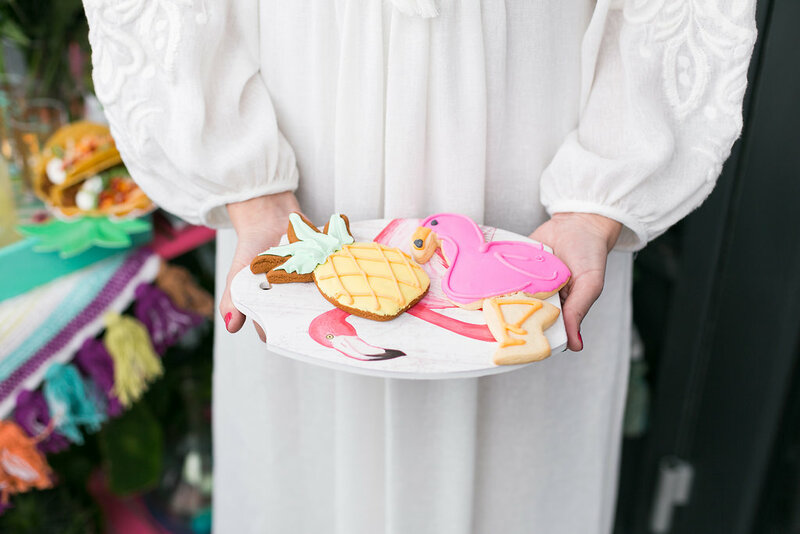 Your guests don’t have to worry about putting all the ingredients together and you can also find so many fun disposable plates at HomeSense. 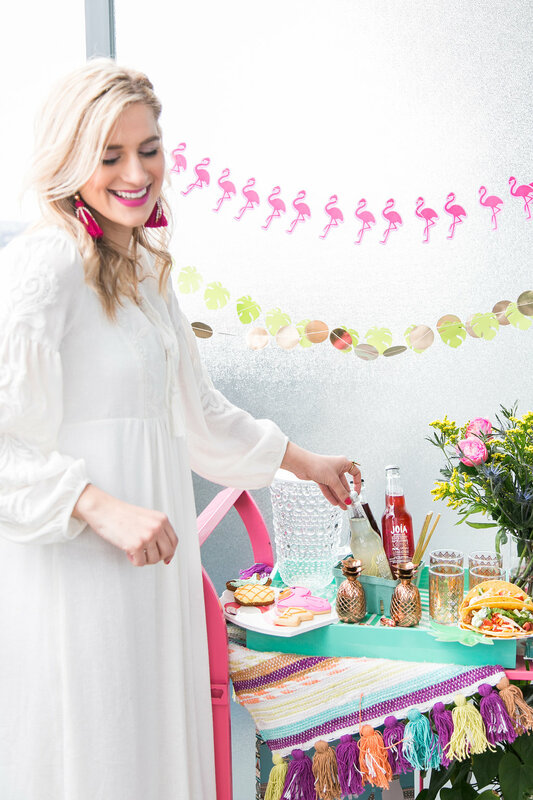 In general, when you have a small balcony, what you want to do is serve all of your appetizers or finger foods on smaller plates or pass around a platter. 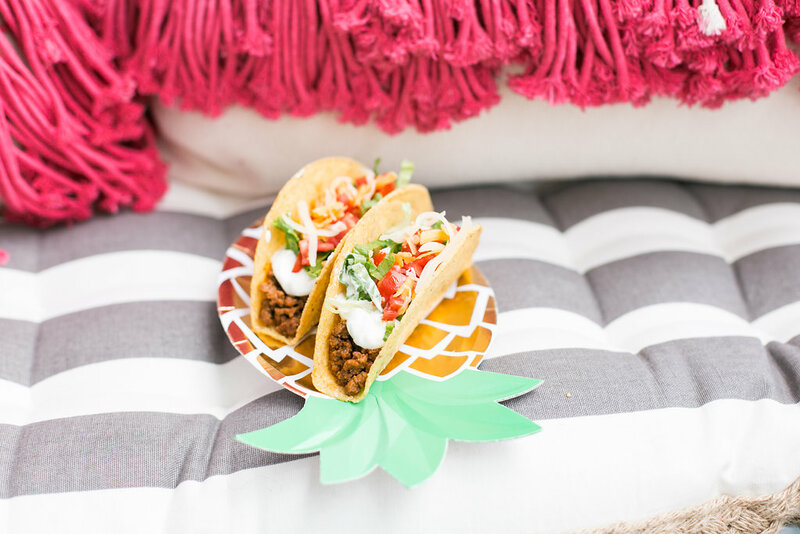 Since you do not have a large table to place all the food, sticking to smaller plates is ideal. My number one solution to living in a condo with hardly any storage space, is to buy patio furniture that can be used as indoor furniture as well. 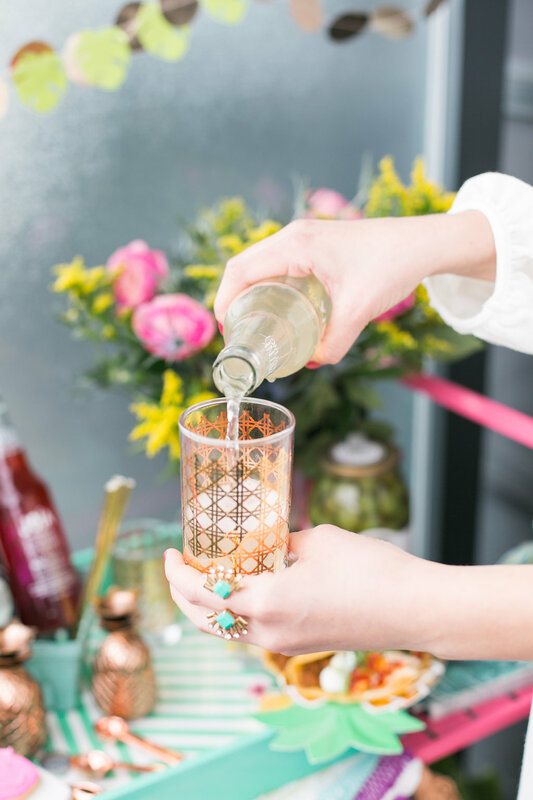 The bar cart is the most fun yet versatile and convenient choice you can ever make when it comes to patio furniture and entertaining your friends. 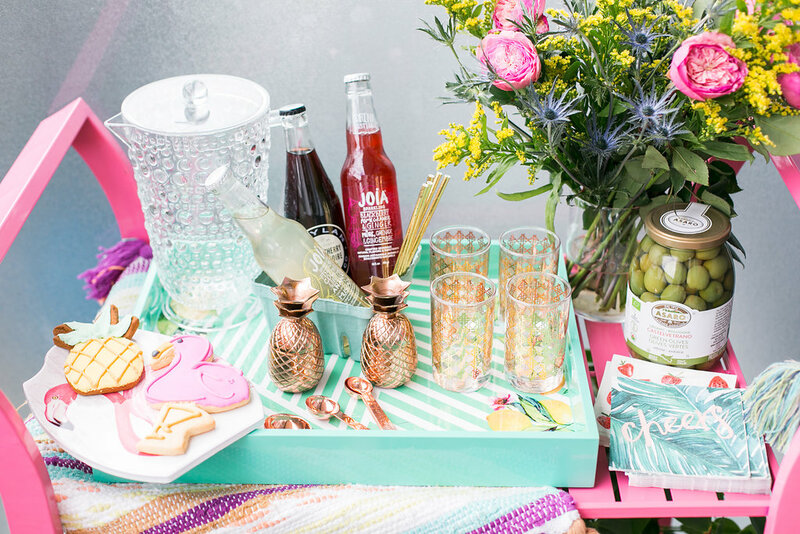 You can fit tons of food and drinks on it without having to go back and forth inside the kitchen when you have friends over, and it acts as the hub of outdoor entertainment. My plans for the bar cart in the winter is to actually place it in our dining room area and use it as our bar cart. 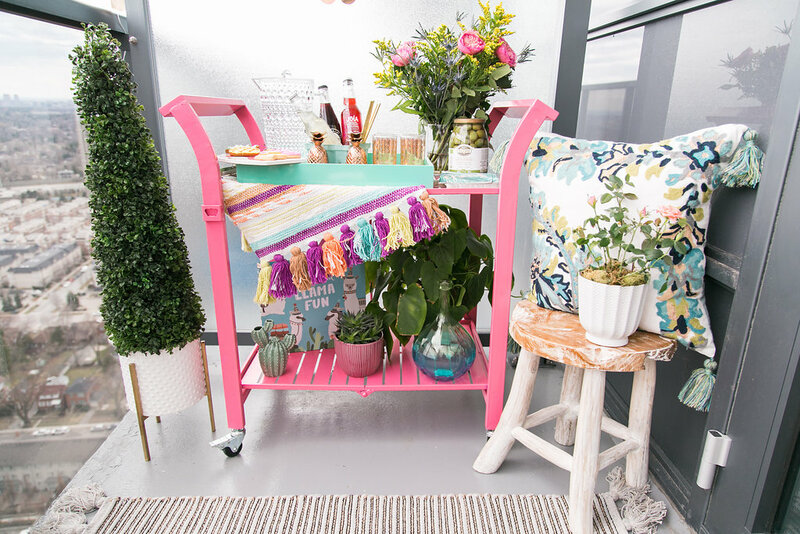 Bar carts are all the rage lately and when you do not want to sacrifice your storage space in the winter you can just pull it inside your home and use it to entertain your friends during those cold winter nights. 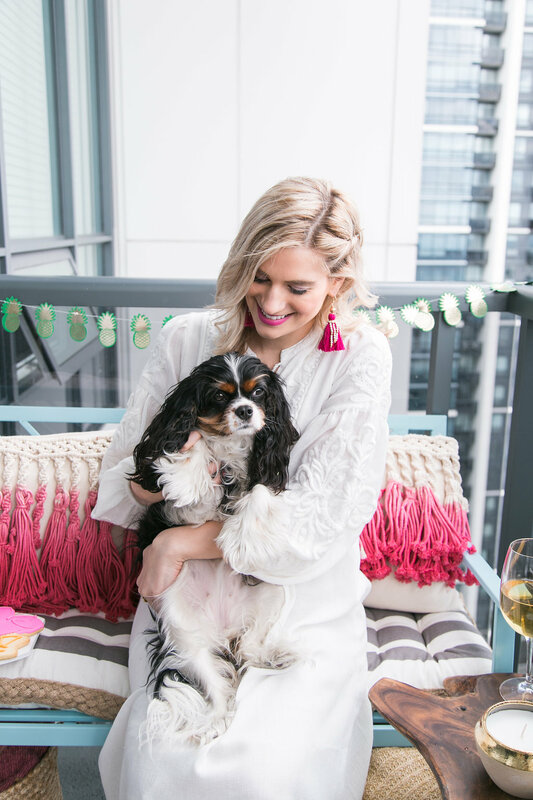 We went with a pink bar cart which does not necessarily fit our indoor décor, but we loved the fact that it will add that pop of colour we need inside our home in the winter. 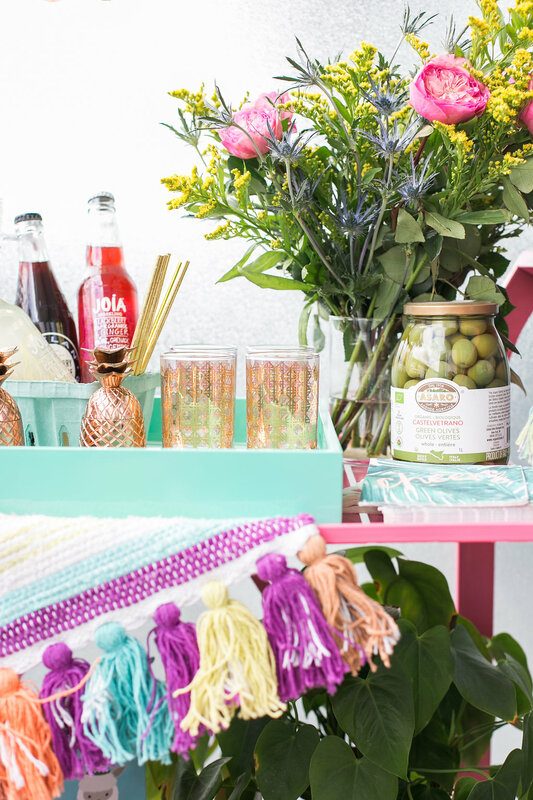 Our bar cart is meant to be an outdoors bar cart, but HomeSense has tons of other indoor bar cart options that may be a better fit for more traditional décor styles. 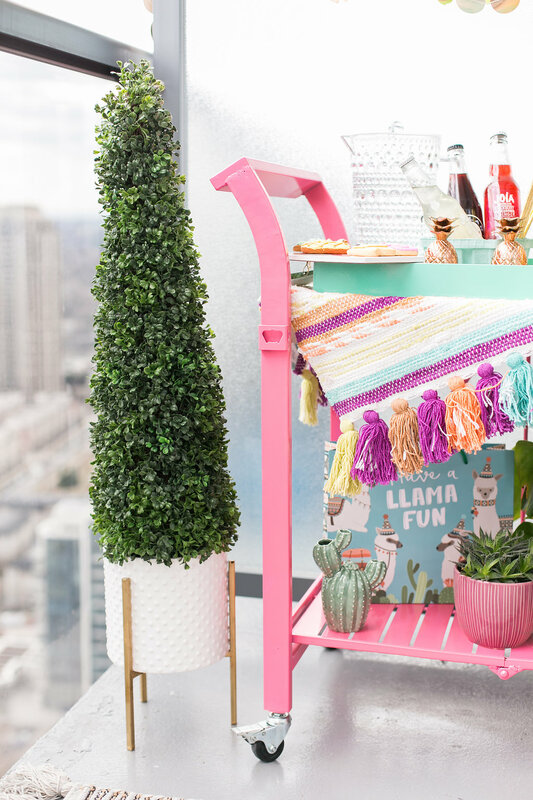 If you love entertaining and serving drinks to your guests on your balcony like we do then I definitely recommend you use the bar cart to do so. Kamiran loves making cocktails for our guests on the bar cart, or sometimes we serve wine or non alcoholic beverages in which case we place all of them on the bar cart and then each guest can help themselves. No need to go back and forth in your kitchen. There you have it. 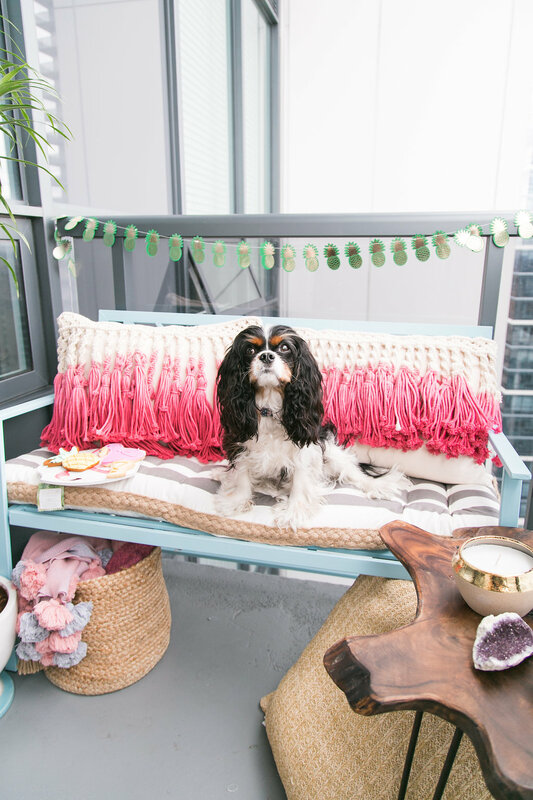 These are all my tips on how to decorate and entertain on your small condo balcony. 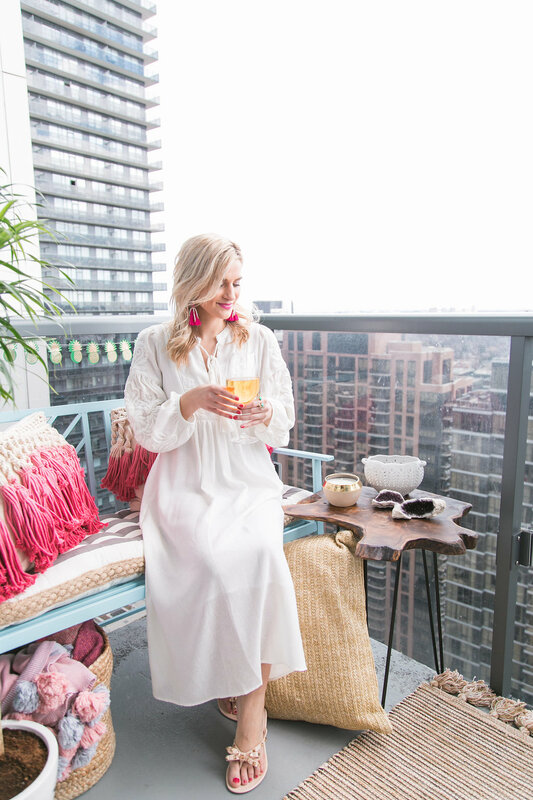 At first it seemed like such a huge challenge to create the perfect entertaining space for our guests considering how small our balcony is, but with the right planning and furniture from HomeSense, we were able to create our little tropical getaway right outside our home. 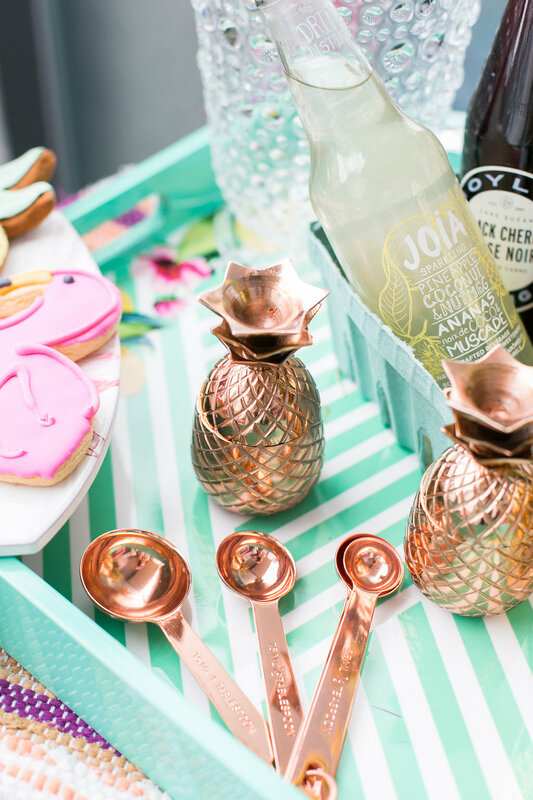 All items in post are from HomeSense except food and drinks. 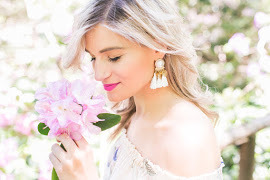 This Post is sponsored by HomeSense, but let’s face it you all know my everyday obsession with HomeSense. These are really amazing ideas. Thanks for sharing.